"Many artists have used such 'pictography' to express themselves, such as Miró, Klee or others. But Tobey had that unique advantage of knowing the mystical value of the calligraphy. 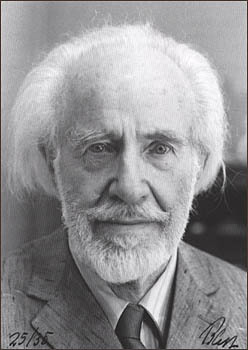 Mark Tobey was conscious that he was creating mystical art." click to see larger photo Except perhaps for the Founders of the world's great religions, no one on this earthly plane can be said to fully understand the nature and composition of the spiritual world. But that has certainly not stopped people from trying to communicate their visions of it. Such attempts can be found in the stained glass windows of Europe's great cathedrals, in the complex filigree of Persian prayer rugs, or in the meditative tones of Buddhist chants - to mention just a few such humble expressions of spiritual reality made throughout history. But what is the modern equivalent? Where might we turn to find a new vision of spiritual expression - one capable of inspiring deep feelings - in our modern, technological and secular age? And are there any who have also captured the contemporary climate of cross-culturalism, interdependence and oneness that surely characterizes the highest expression of spiritual values today? There are certainly many artists, musicians and architects who are seeking to realize such a vision. 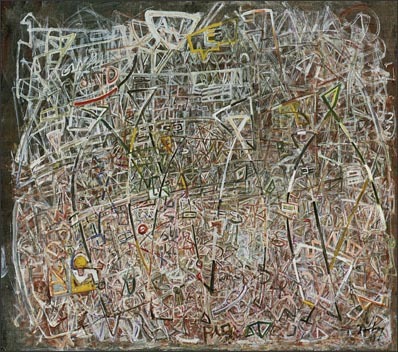 One individual whose work would certainly be a starting point in such a survey is the American painter Mark Tobey. Tobey, who was born in Wisconsin, USA, in 1890 and died in 1976 in Switzerland, has gained increasing recognition in recent years - an appreciation that has perhaps reached its highest point yet in a superlative retrospective exhibition at Spain's prestigious Museo Nacional Centro de Arte Reina Sofía, held from 11 November 1997 to 12 January 1998. The exhibition brought together about 130 works from some 56 different collections, covering the years from 1924 to 1975 - virtually the entire creative period of Tobey's long and productive life. The exhibition included works in oil, watercolor, charcoal and tempera, and it sought, in the words of the catalogue, to "explore Mark Tobey's complex pictorial world, emphasizing its most transcendent aspects." The curators succeeded in their goal. The exhibition not only showcased the great range and diversity of Tobey's work but also captured and conveyed the deeply emotional - and, we must add, "spiritual" - content of his vision. The exhibition in Madrid provided many fine examples of both the white-writing and all-over styles, from Broadway Norm (1935) to later works such as White Writing (1951), Shadow Spirits of the Forest (1961), and River Fog (1970). A careful examination of the works gathered in Madrid also tell much about Tobey's attempt to express his vision of spiritual reality. 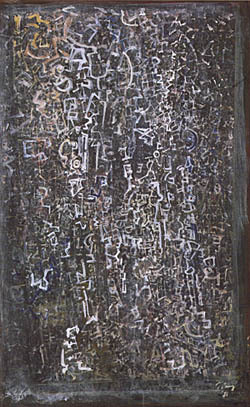 On the surface, this aspect of Tobey's intention can be understood simply from the titles of many of his paintings: Saints and Serpents (1953); Meditative Series I (1954); Fragments in Time and Space (1956); Prophetic Night (1956); Mysterious Light (1958); and Prophetic Light Dawn (1958). But even where the titles do not indicate a specifically spiritual theme, the luminosity, complexity and, indeed, ethereal nature of the paintings often combine to transport the viewer to a wholly different place. Take, for example, New Crescent (1953). At first glance, this tempera painting done predominantly in yellow-greens and white over a dark field appears to be a rather flat and monotonous abstraction in the all-over style. Yet careful study shows the work to be multi-layered, and with many regions of lambent radiance and lustrous depth. It might be best described as shimmering with the colors of moonlight. After a time, viewers can easily find themselves being pulled into another dimension. Beyond such traditional or mystical elements of spirituality, there is also a way in which the titles and the paintings themselves work in concert to express new spiritual ideas for this age. Take Red Man, White Man, Black Man (1945) which, given Tobey's religious beliefs, must surely be understood in part as an expression of the oneness of humanity. Almost entirely abstract, with the calligraphic features of white writing, it also appears to create an interconnected web or network uniting the barely perceptible human figures that populate some regions of the canvas. Or consider the four paintings presented in the exhibition from the Above the Earth series, created between 1953 and 1956, which each depict a portion of a circle in space (presumably the Earth). They seem prophetic of the famous photographs that would be taken, a decade and a half later, by astronauts and which show the Earth in all its oneness. Such themes are Bahá'í and Tobey was, as is well known, an active Bahá'í from his acceptance of the Faith in 1918 until his death. Art critics and historians of various backgrounds have agreed that Tobey was enormously influenced by his religious beliefs and that he sought to express elements of them in his paintings. "Bahá'í provided Tobey with aesthetic as well as social and religious principles," wrote William C. Seitz, curator of Painting and Sculpture Exhibitions at the Museum of Modern Art in New York, at the time of the Museum's 1962-63 exhibition of Tobey's work. "He has often stated that there can be no break between nature, art, science, religion, and personal life… Few religions…have given the concept of oneness such pointed emphasis, and few modern artists have dealt with it as explicitly as has Tobey." The significance of his Faith in relation to his art is something that Tobey himself acknowledged on many occasions. "The root of all religions, from the Bahá'í point of view, is based on the theory that man will gradually come to understand the unity of the world and the oneness of mankind," Tobey wrote in 1934. "It teaches that all the prophets are one - that science and religion are the two great powers which must be balanced if man is to become mature. I feel my work has been influenced by these beliefs. I've tried to decentralize and interpenetrate so that all parts of a painting are of related value... Mine are the Orient, the Occident, science, religion, cities, space, and writing a picture." In his life, as well, Tobey lived as a world citizen, eschewing any notion that he was an "American" painter. He spent his early years in the American Midwest, and then began working intermittently in New York in 1913. He first moved to Seattle, in the American Northwest, in 1923. He also made several trips to Europe and the Middle East in the 1920s and he lived for a time in England. In 1934, he went to China and Japan, where he stayed for a number of months in a Zen monastery near Kyoto. After World War II, he continued to live and work in Seattle, but in 1960 he moved to Basel, Switzerland. 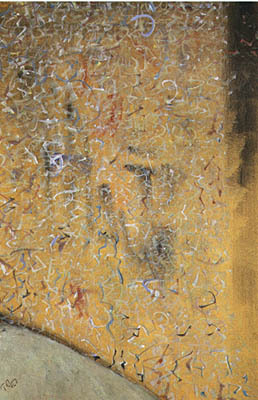 Kosme de Barañano, one of the curators of the exhibition, characterizes him this way: "Migrating from continent to continent like a restless bird in search of propitious seasons, casting his glance across all cultures, Mark Tobey was one of the few 20th century artists who was truly cosmopolitan and in fact trans-avante-garde. Besides being a pioneer of American abstraction, he was a scholar of oriental calligraphy and Renaissance tempera." Ferran Roca Bon, a contemporary painter in Barcelona who is also a Bahá'í, spoke about Tobey in a recent interview. "He was a very sensitive person, self-educated, cosmopolitan, spiritual," said Mr. Roca Bon. "He opened himself to spirituality and discovered the sensibility and refinement of the Orient, and thanks to the Bahá'í Faith, he discovered the 'magic' of calligraphy. Mr. Roca Bon said he believes that, in fact, Tobey's white writing was inspired by the style of Arabic calligraphy which is manifest in original letters and tablets from Bahá'u'lláh, the Founder of the Bahá'í Faith, whose fast-flowing revelation was often transcribed quite rapidly by special secretaries, creating something like an an all-over composition in its initial form. "Many artists have used such 'pictography' to express themselves, such as Miró, Klee or others," said Mr. Bon. "But Tobey had that unique advantage of knowing the mystical value of the calligraphy. Mark Tobey was conscious that he was creating mystical art." Tobey won international acclaim for his work towards the end of his life. He became the first American since James Abbot Whistler (1834-1903) to win the Painting Prize at the Venice Biennale, an award he won in 1959. In 1961, he had a retrospective showing at the Louvre in Paris, an extraordinary tribute to the work of a living artist. These landmark achievements were followed by a major exhibition at the New York Museum of Modern Art in 1962 and, in 1974, another major show at the National Collection of Fine Arts in Washington, which is part of the Smithsonian Institution. Art critics and historians in the United States have long been uncertain exactly how to categorize Tobey. Many gave Pollock most of the credit for creating the all-over style. Others have suggested that Tobey's internationalism and even his religion have so far kept him from being accepted in mainstream art circles. The Madrid exhibition and its outstanding catalogue, one can hope, will set this sense of underappreciation aright. For certainly it revealed that Tobey, while defying categorization, must be counted as one of the 20th Century's most innovative and, ultimately, influential artists.